Jocasta says love is in the air!! Victoria says they might be the next Jeff and Jordan! Big Brother Spoilers > Big Brother > Big Brother 16 > Jocasta says love is in the air!! Victoria says they might be the next Jeff and Jordan! 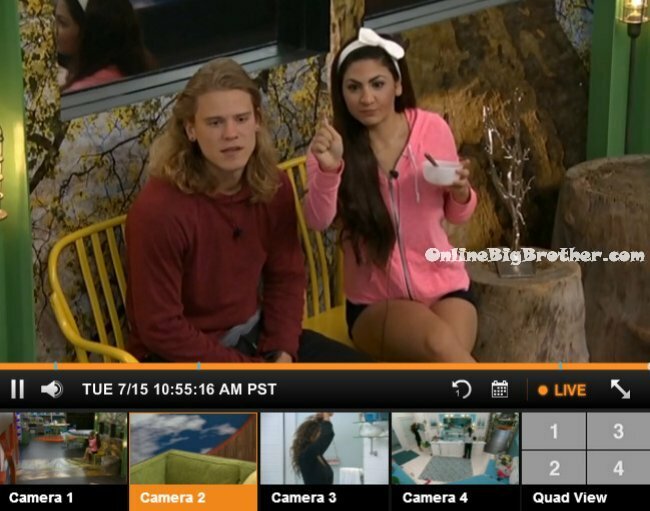 10:45am Victoria joins Hayden in the living room to eat her cereal. They move over to the bench by the front door and look at the memory wall. Victoria comments on how the last four that haven’t been havenots yet are Jocasta, Donny, Frankie and Christine. Victoria asks if he thinks Joey and Pow Pow are watching? Hayden says yeah but not the Live Feeds . Hayden then starts guessing their ages based on their memory wall photos. 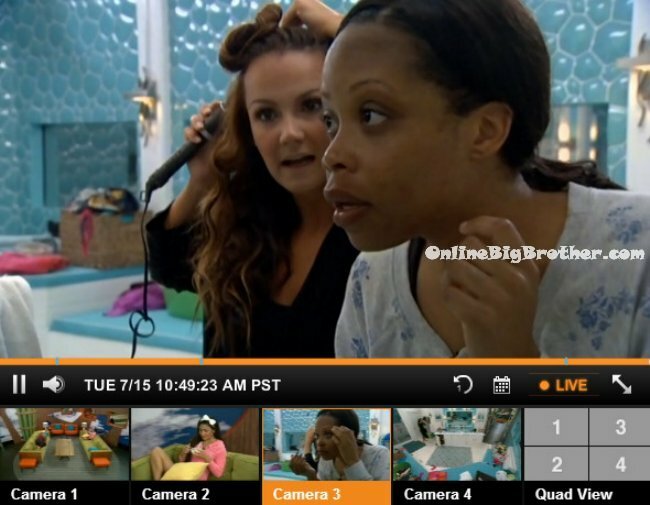 10:45am – 11:15am In the bathroom – Brittany and Jocasta are getting ready for the day. Brittany wonders why the backyard is locked. She says maybe they’re setting it up for us with an ice chest, margaritas and wine for the mommas. Jocasta says you’re crazy. Brittany whispers to Jocasta that she and Cody were whispering in bed and Cody said he would put up Donny. Brittany says and Donny was right there, I know he wasn’t sleeping. I feel like I need to say something or I’m going to end up on the block again. Jocasta says oh god. Brittany says I want to tell Donny that Cody only said his name because he’s been up there a few times. Brittany comments that Donny has been acting differently towards her ever since. Brittany says that Cody keeps saying he’s going to win HOH. I’m thinking its going to be a tough battle for you because this momma wants to see her kids. In the kitchen – Victoria whispers to Jocasta and then laughs (About Hayden and Nicole kissing last night). Jocasta says aww that’s so sweet. Jocasta says love is in the air!! Victoria says they might be the next Jeff and Jordan! Jocasta says that would be nice. Victoria then heads to the storage room with Hayden. Victoria asks what he talked about in the diary room. Hayden says I said my goodbyes that’s it. Devin comes up to Jocasta and does some quick campaigning. He tells her that Caleb being here isn’t good for her game because he and Amber are votes for each other. In the bathroom Devin starts campaigning to Brittany. He tells her that for your own game if you and been up on the block and say it was you and Amber or Caleb… and if they win the veto they would use it on each other. And if I was here you know I would use it on you because I’ve already done that even when we were at our worst. Brittany says yeah but people are scared to vote. Devin says most of the competitions have been physical .. but more and more they’re going to be mental and Caleb won’t beat me in a mental comp. He still gets nervous before competitions. Even though their not a power couple they’re dangerous. He would do anything for her and she uses that to her advantage. I don’t even know what you would call their relationship. Brittany says fatal attraction. 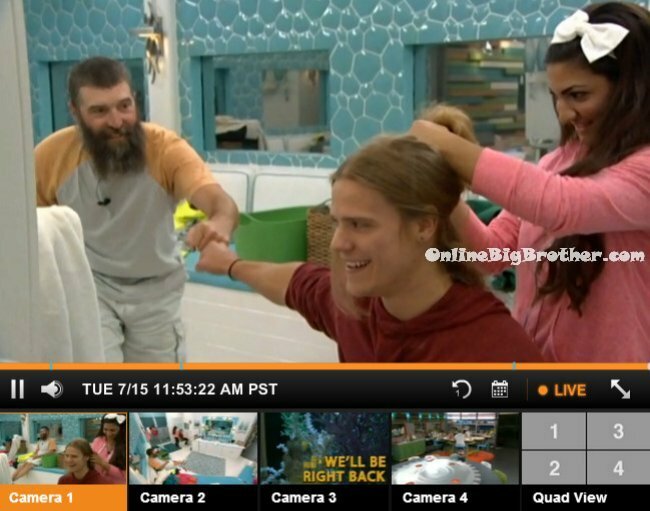 11:50am – 12:10pm In the bathroom – Victoria is curling Hayden’s hair. Victoria says that Nicole isn’t going to recognize you. Victoria tells Hayden that his hair is very thick on the bottom. It’s balanced. Hayden says so are you! Hayden laughs. Hayden asks Donny am I right!? Donny and Hayden give each other a pound. Brittany comes and comments on how she love Victoria during the day but hates her at night. Victoria asks why? Brittany says because I want to go to sleep at night and you won’t stop laughing. Victoria says that only happened twice. You make it sound like it happened every night of the 4 weeks we’ve been here. Hayden tells Victoria that he wants to give her a nickname. Eyebrows. Donny asks Victoria about how she got picked up by a crow when she was little. Victoria says she is so petrified of birds now that it makes her cry when she sees them. Devin asks Derrick can I talk to you up in the HOH room. They head upstairs. Devin says I know Caleb volunteered to go up on the block to save Amber. I know you have a lot of pull in the house but god for bid you ever got put up on the block with him or Amber. Big Brother blocks the feeds. When they come back – Derrick says we will have to see how the week plays out. I don’t know how the votes are going and no one really does. Obviously I put you up and backdoored you because I want you out of this game. But I wouldn’t be surprised if Caleb goes home to an 11-0 vote. Big Brother blocks the feeds again. When they come back – Devin asks if there is anything I you could do to help me stay I would appreciate it. Derrick says there is one thing I am not doing is I am not campaigning to get you out. If you hear that then tell me because then I will address it. I am not trying to convince any one how to vote because I have no more power. Devin tells Derrick if I stay I want to work with you later in the game. Derrick says my problem was you not coming to me in the beginning when you started to hear things. Devin says I couldn’t keep Zach in this game due to the things he said about women and me having a daughter.. I just couldn’t let that slide. 12:25pm Nicole walks through the kitchen and Hayden says I curled my hair do you like it!? She asks him who did it? Hayden says Victoria. Cody comes through the kitchen and tells Hayden he looks like a tool. In the kitchen Devin tells Derrick about the patch he puts on the inside of his arm. It’s to cover up a tattoo of an angel with his sobriety date under it. Devin says “I used to pop pills like they were tic tacs!” Devin heads outside to play pool with Cody. Devin starts campaigning to him. Devin says think of this .. you and Caleb on the block and Amber has the veto .. you know who she’s using it on. 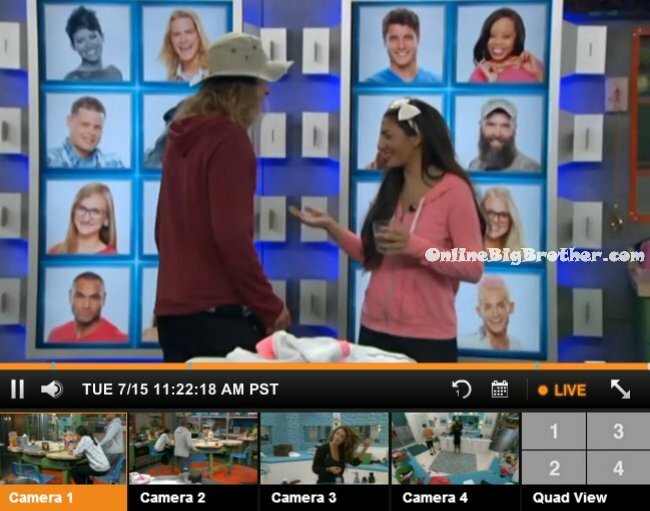 Or if you’re on the block with Amber .. Caleb’s using the veto on her. Cody says I will be completely blunt .. with all the stuff that got stirred up it just makes me nervous. I think you’re 80 times better player than he is. Cody tells Devin that he will think about it. 12:40pm – 1pm Out on the backyard couch – Brittany talks to Donny and tells him I think I’m going up on the block. Donny says I know I am too. We don’t fit in their click.. we’re outcasts. I haven’t fit in since the beginning. Brittany says hopefully if you, me or Jocasta wins HOH to feel safe. Donny says one of us will definitely go up, we might not go home. Brittany tells Donny that the other night she didn’t say anything bad about him. Donny tells Brittany that he didn’t hear her and Cody’s conversation last night. Brittany says I would never throw you under the bus. Donny tells Brittany I will protect you if I can. Brittany says thank you and says she will protect him too. Donny says we are alone but since we’ve been categorized we have been put together. Hayden comes over and asks Donny for a surfer nickname. Donny says Gnarly Nate. Not even the HG’s care and showmances are always threats. Good. Please stay Devin. 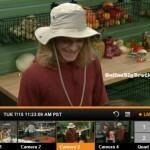 He is truly both brains and brawn he was the first one to get someone to throw the BOB so he could stay HOH. I believe Derrick knows that Caleb will be much easier to manipulate. IF Donny doesn’t break up the remainder of the BS, he will soon be out of the house. Devin should ask Jocasta about a two week alliance. Please no, not another season of what the house wants! It is kinda the reason I would kinda like a Season of people that have never watched Big Brother. People keep on playing other peoples Big Moves, Strategies and terminology and nothing is fresh. I think Helen put a curse on me…. He should ask Donny, Jocasta, and Brittney, for a forward alliance, and subtly feel out, and possibly recruit the others. Getting rid of Hayden might be their key to getting Nicole on board. Otherwise, these dumbasses have no chance. Maybe it happened while you were watching The Young and The Restless! Who freakin gives a rats a$$… SMH !!! In my fantasy, BB’s twist this week is that your team must WIN to stay HOH. Then, like someone else suggested here, provide a (unstated) prize/cash incentive to those on the block and two HOHs to ensure the BOB is not thrown. Rewards ends up being nominal, like $1.00 for each. I don’t think anyone can beat jeff and jordan doe. umm when did cody whisper in brittanys ear about donnie does anyone here know anyone someone please tell me simon or dawg did we miss something on the live feeds or is brittany really a lying sack of s..t.
Simon and Dawg: I have enjoyed your site for a few seasons and I am grateful for the light that you have shone on these so-called reality shows. Without your efforts I might have continued to be a sheep who believed that Big Brother, as well as similar shows, were truthful. You’ve taught me about the power of editing and I am happy to show my support for you by clicking the Amazon link. Thanks to you, I have a great excuse to shop and two packages should be on my doorstep before Devin is evicted on Thursday…assuming that production won’t be intervening with some special power that rewinds the show and keeps him in the house. Thank you for doing your amazon shopping through our link. We appreciate it. I’m not a Devin fan at ALL but would love a BBH shakeup!! is caleb’s amber conversation before or after devin mentions his daughter? Boiled Rabbit - Beast Mode Style! Britanny coming up with ‘fatal attraction’ to describe Amber and Caleb is amazing! I am beginning to wonder if Caleb ordered ‘A Beginner’s Guide to Wooing Women’ from Amazon and they sent him the complete series of Family Matters by mistake. Not knowing the difference he watched the show and his takeaway was “Wow mom, that Urkel fellow has mad game.” I fully expect him to begin mumbling “I’m wearing you down like a Beast Mode Cowboy” at any moment! LOL – LOVE IT!!! And He he does where those Big Dark Rimmed Nerd glasses from time to time…. Maybe you are on to something! In a earlier post Victoria mentioned being”picked up” by a crow. I wanna see this crow. Little bit over the top Queen Victoria. It was probably a buzzard, mistaking her for road kill. Haha. I was wondering the same thing!! But then I realized that maybe it was typo. I think the crow pecked her not picked her. But If I’m wrong, I would also like to see that bird that picked HER up. Must have been before her nose grew in…no earth inhabiting creature has the grip strength to carry that kind of weight…except maybe Caleb’s pinky finger. I wanna know when Cody is going to make his move on Brittany. Always talking about how hot she is.. Cody’s a cute kid and all but he seems like the kind of guy who talks a good game and can’t hold a conversation or “get the girl.” Just saying..
And good for Hayden! He’s adorable, smart and interesting and it’s about time Nicole gave him a chance. Is this really Big Brother? I could have sworn it’s The Dating Game. Okaaaay, everybody, HOOK UP!!! Victoria sued for some serious weak BS. No kidding. Really, was it worth all that to sue the town and waste taxpayers money because you are clumsy? I like Hayden also. I think he’s one of the more genuine nice people in the house. I am just waiting for the Hayden & Donny alliance to form. It seems like it is close but just not sealed. Them two could do some damage. Hayden can work Nicole & Cody. Donny can work Brittany & Jacosta( even though that is not saying much). they could bring the heat to the establishment. That’s what I’m hoping for also Diviasee! Just one question please: Could it be possible Caleb and Amber are really a couple in true life? Pulling a joke over us all. Both from same area have a lot in common in their bio’s, likes a lot of the same things, Just wondering here. If that were true they would have to be married for a,long time for her to be that disinterested in him! I know he’s always talking about how they don’t live that far apart, but her bio says she lives in California now. Has anyone heard her mention living in Cali? LOL at the things people “thumbs down”. I asked a simple question and 2 people actually felt the need to click thumbs down. Funny. Anyway, it does say on the CBS site that her current town is North Hollywood, California and I just wonder if anyone in the house knows that. You asked a question and people are answering. Thumbs up = yes Thumbs down = no. Nobody’s disrespecting you. The best move for everyone is to get Caleb out now blindside him and he doesn’t even have a chance to stay. I don’t see anyone coming after anyone for getting him out, I don’t even think Amber cares that much. Devin is a crazy one but they can get him out at anytime. These people are playing too nice, when you have a opptunity to get someone out like Caleb you take it. Devin- Proven to be a competition beast. I do believe devin is the more dangerous one out of the 2 nominees. So, the same can be said about getting him out while you have the chance. They can come after Caleb anytime. Caleb is not as good as he thinks he is. Yes, but then Donny wouldn’t have numbers on his side. If they get rid of Devin that means “the house” is all powerful….and here we go again. Replace Amanda and McRae with Derrick/Cody. Exactly Delores! Donny needs a power player on his side. If he could get Devin & Hayden then he might stand a chance against Derrick, Cody & Zach. The “outsiders” really need Devin right now (& of course Hayden too)! I would so love to see Hayden & Donny in the final 2!! Is NOT a thing. Everyone still plays for themselves but when the majority is doing something it makes no sense to out yourself as a decenter. Hayden and Nicole, the next Douche Bag and Adorable Dimwit(Jeff and Jordan)?? Donny should use the POV and take down Jocasta and put up Amber. Caleb would freak out. Let’s see how ‘fatal attraction’ he is for her and if he’d sacrifice himself and let her stay. Devin is the main target. He has to go. and getting rid of Devin will hurt them more than it would help. and it wont be long before all of them are sent home and they’re gonna wish they would have listen to Donny about getting the 8 (7 really because Devin quit the alliance ) out. Couldn’t agree with you more Captain Crunch! Donny needs Devin – not only for the numbers, but for his power as well. Let’s face it, unless Donny gets Hayden on his side, Donny really doesn’t have much power players in the other “outsiders.” And also – if Caleb goes – Amber might even switch over to Donny’s side. Remember in the beginning, she liked Donny & said she found Devin attractive. Strangers things have happened. I would love to see Caleb watching Amber & Devin “working” together! It would be stupid if they decide to evict Caleb and keep Devin- Devin is BEYOND unpredictable- he doesn’t keep his mouth shut – he runs on emotions and doing so kills everyone’s game whose in an alliance with him. Yes, he is the big target in the house, but in turn he makes people aligned with him targets also. He has to go! It would be stupid for Derrick’s team, but not for Donny, Britney, Jocasta, Nicole, Victoria, and even Christine, and Frankie. Puppet Master Derrick wants to keep Zack, Cody, and Hayden around, picking off the others, starting with Caleb, then Donny after Devin. If Devin won veto, they were going to evict Caleb over Jocasta. But chances are Nicole, Victoria, Christine, and Frankie will not go along with it. With Devin in the house he will be the target of Derrick’s team and vice versa. the smarter move ti get devin out for sure. they need to get rid of devin. he’s smarter, he’s better at competitions. if they dont get devin out now they’ll regret it.devin could very easily rally brittany and donny, victoria and jacosta to face off against derrick and his side and then derrick, zach and cody will be screwed. caleb has no game , he’s a vote on the side of derrick that also brings amber with him and he’s not done well in competitions since that first HOH. devin is a huge threat to derrick, cody and zach and if they dont see that and get rid of him now they are morons. It is better to get out Devin… he is bad for everyones game, especially his own. There is a part of me that wants an upset… not to see Caleb’s face. He isn’t that bad of a kid, just foolish with his heart and his loyalties…. the Amber thing is a bit annoying. My only reason fro wanting Caleb out would be to see if Derrick, Cody and Zach can count the numbers and realize that they did not save Zach as much as the house wanted to say no one controls the house. I do hope Caleb stays and Devin goes home…. but, there is the BB Fan in the back of my head screaming HOUSE FLIP. They should get Caleb out asap. Devin might be a nutjob and under any other circumstance I would say get him out (especially after last week) but the way things ended up moron Caleb put himself up and with that big of a target you take advantage now because you might not get another chance anytime soon. They are all far too worried about not getting blood on their hands but blood on your hands means nothing if you lose. I really do not get everyone thinking Caleb is a threat. He has done nothing to prove it. He won one competition against only half the house. Frankie might have beaten him if they played at the same time. Devin has proven he is smart and athletic. He is a bigger threat than Caleb is any day. If Caleb was half as good as he thinks he is, he would have already won this game. The only reason to get Caleb out instead of Devin is if you are a Donny fan – which I am! I want Devin to stay for entertainment purposes. But it would be in every houseguests interest to cut him out now. He’s too unpredictable and too much of a loose cannon and a player like that isn’t good for anybodies game because he can and will turn on you at any moment for any ridiculous reason. Caleb won’t be that tough to get rid of in the future either, he’s not that good. I do think there are some good players in the house this season who are playing a very smart game. However, regardless of good game play, it is painful to watch the aired show and live feeds because every cast, year after year, are like little sheep following the previous cast, doing exactly what they did. For example: “Who wants to see my HOH room”? The only reason that started was because in that particular season, if you won HOH, your room was decorated specifically for you and each HOH had a completely different looking room. But, every cast since has kept that going because nobody can think for themselves. And the whole ‘voting with the house’ thing is annoying, too. They do it because almost every other season has been like that. These “super fans” going on the show should know how much that is hated. Play your own game, you’re not playing for the current HOH to win the $500k, you’re playing to win the $500k yourself – so keep the person who will benefit your game, not the other way around. But these super fans are usually the first ones to cave and vote with the house. Production definitely needs to do something to prevent this from happening in future seasons. I see where they were going with the two HOH’s and the Battle of the Block thing, but the house has figured out a way to overcome that too and still get out who they want by throwing the BoB competitions, etc. Production figured this would help eliminate ‘voting with the house’ and the predictable/boring seasons they usually have. I think they need to pull a page from season one and not allow them to discuss nominations or votes, period. I agree Jocasta told Christine “Play your game, don’t let anyone play it for you.” She told her she needed to decide what would help her(Christine) win the $500,000. In other words strategize for you…what’s this make it to the jury….forget that win the money. It would be entertaining if Devin stayed and Caleb left game wise. But Devin is so unpredictable with how he changes his mind and allows everyone a front row seat with surround sound while he’s doing it. He also doesn’t listen and consider how he comes off to other people. A big part of the game is social politics and whether you can make them work or influence them to your advantage. I wish he wouldn’t have torched his game like he did and it started way before he won HOH. They probably think Caleb is far more easier to control at this point and the chances of him doing something emotional for his infatuation exposes a major weakness. Too bad he can’t just be rational and logical and have a crush without taking it as far as he has. Plus he’s too macho in his thinking. He’s acting like she’s a piece of property to obtain without even knowing it. So I don’t see him getting voted out but I wish they would just for the sake of the game and nothing personally against Caleb per se because Devin is a train wreck in there. After reading the comments, I want to look at the Jury (big picture) and which HG’s I want voting for the winner (if I was in the house). I would not want Devin or Caleb in Jury but Devin would do the most damage trying to influence the final voting, so Devin’s got to go first, then Caleb. Devin stays, Devin gets HOH again. Devin can’t help himself, it’s a repeat performances of his first HOH. No Bomb Squad to back him up this time (they all want him out). Devin is the weakest HOH in BB history. Production is happy. We are entertained. Caleb is no longer. Amber can troll for another (sucker). Well, I can dream, can’t I??? Zach says I am the biggest a$$hole jerk and I am going to have b***hes lined up ..
Donny talking about Derrick – I think that’s the ring leader, the brain of the operation.